Cavities and tooth decay are not normal. There's also more you don't know about root canals. How does our oral health affect the health of our whole body? 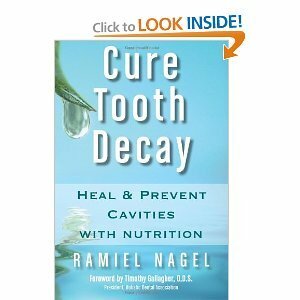 Learn about this and more dental issues as well as how to heal cavities naturally. Guess who was first to add fluoride to their water? I came across a piece of very interesting information recently as I was doing more research. According to the National Cancer Institute, the first city to implement community water fluoridation in the U.S. was right here – Grand Rapids, Michigan in 1945. Is fluoride a poison or good for our teeth? 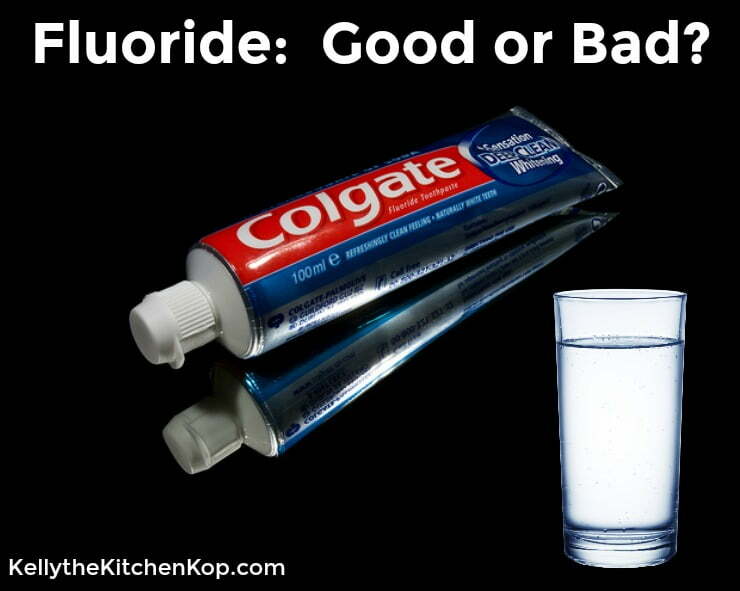 The topic of fluoride safety is just like so many others, there are heated debates from both sides. I'll explain how and why I came to my conclusions, and you can take it from there. You don't have to go far to find the many arguments “for” the benefits of fluoride, to start just ask your doctor or dentist. Recently I spoke to an orthodontist and asked his opinion, I wasn't surprised that he agreed with conventional thinking on the topic. He told me that since this area began community-wide water fluoridation, tooth decay has decreased significantly. He also said he notices a definite difference in those with well water vs. city water, however he did say some patients come in who drink well water and have teeth that still look great. “They must really brush well“, he said. I asked if he didn't think good nutrition (less refined and processed foods, etc.) might play a role along with genetics. He agreed that both were probably true. (I also asked him if he's heard of Weston Price. He thought the name sounded familiar…a good start anyway.) Most dentists agree that fluoride can be dangerous in higher amounts and remind us not to swallow our toothpaste, but they say the amount we're getting in our drinking water is at a safe level. Fluoride may lead to increased insulin resistance, glucose intolerance, and diabetes. Fluoride’s ability to damage the brain is one of the most active areas of fluoride research today. Over 400 studies have found that fluoride is a neurotoxin (a chemical that can damage the brain). Learn more here. Although dentists aren't convinced of the harm fluoride can do and feel the benefits outweigh the risks, there is enough evidence for me to seriously doubt its safety. Once again, I had to use my criteria for getting to the truth. I asked, “What is more natural?” Adding something to water that doesn't naturally occur there, or at least not in the amounts they're adding in, doesn't sound natural to me. And if a substance is dangerous in certain amounts, a fact that everyone agrees on, yet we can't control how much we're getting in our water, how can that be safe in a totally random dose to all different ages and populations? 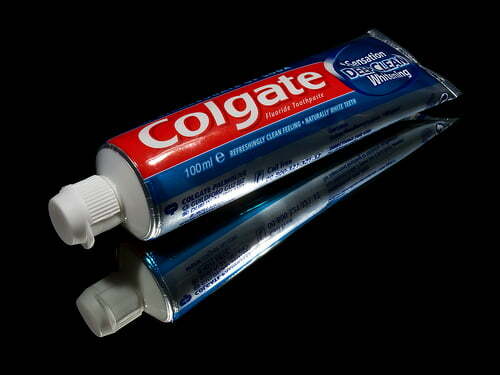 We use natural Fluoride Free Toothpaste. Or we make our own toothpaste. We got a new whole-house water system to be sure we weren't drinking fluoride (or chlorine) OR bathing in it. We also have this drinking water filter that gets even more of the fluoride and chlorine out AND any other toxins such as pharmaceuticals, lawn fertilizers and crop pesticides. Read more about that here and see exactly how much is filtered out: Why we ditched reverse osmosis water and what we got instead. We don't get fluoride rinses at the dentist's office (or x-rays for that matter). Of course, as you know by now, we try to eat nutritious meals and we brush twice a day – most days anyway! So far no one has had any dental problems (hopefully this continues) and I feel better knowing we're not ingesting something that could be harmful to our bodies. I hope you'll take the time to read a little bit more on the topic below and decide for yourself. Here are 49 other reasons why water should not be fluoridated. 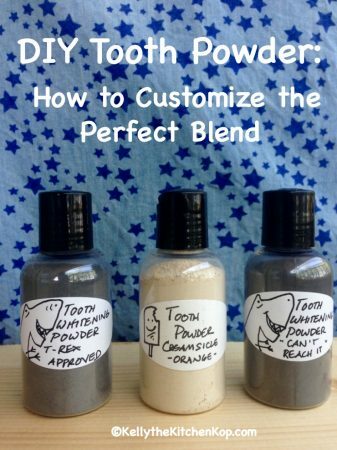 I also make my own tooth powder/pastes and rinses. I typically use some baking soda in these mixtures, however I have seen (only a few) comments from people saying that the only reason their teeth seem to be getting whiter from baking soda brushing, was because the baking soda was causing them to brush away all the enamel from the surface. This does not seem correct or logical, as I would imagine that your teeth would turn translucent and possibly discolored if that happened…not white. Have you ever experienced this? I so far have not, but I am by far no expert, but it seems to me that the baking soda is beneficial. I’ve given up on toothpaste and many other harmful body products and follow recommendations at WAPF. Instead of toothpaste I’m using a couple drops of stevia and peelu fibers. You get a little foaming and safe cleaning that’s mildly sweet. Who told us we need to have a mouthful of bubbles anyway? Could it be possible that the fluoride has filtered down from the factories to the ground water? If those animals living nearby were dying from the waste products where did those products go? They certainly did not simply disappear, eh? I like how Wow thinks that our unvaccinated children will put his/her vaccinated children at risk for disease. Where’s the confidence in vaccines? If Wow’s children are vaccinated, his/her mind should be at ease for having done his/her part! I go to a “natural” dentist who does offer flouride but is accepting/supportive of our family’s decision to opt out. We get a pumice scrub and flouride free rinse. In discussing alternatives with them, they mentioned that baking soda was too abrasive on the teeth to be used every day–I assume salt would be the same. They recommended just once a week for these. Just thought I’d pass it along. Great discussion here! My son and I no longer use toothpaste. I’ve been using Good Gums tooth powder for over 6 months. I paid $12.95 for it, which seems like a lot, but I have had my container that long and it’s not empty, just a little more than half of it is gone. Unfortunately, they are raising the price of this product on Jan. 1st, 2011 to $19.95. But it’s still cheaper than if I were to use toothpaste (in 6 months I’d have gone through at least 5 or 6 tubes of toothpaste). My son has chosen now to use baking soda and sea salt instead of toothpaste. He’s never cared for the taste or texture. My husband is still using Jason’s Sea Fresh. I would like to get my husband off of toothpaste eventually, as there are few even in the health food store that don’t have glycerine (which blocks remineralization of teeth). I really like Good Gums, but I’m not sure if I’m willing to pay $19.95 for the container I already paid $12.95 for earlier this year when I can make my own at home with herbs, baking soda, and sea salt for probably a lot less. I have been convinced for many years that fluoride in the water is dangerous. Like Kelly, I think anything that is added in (and especially anything like the type of fluoride added into municipal water systems from the aluminum industry) is probably not okay to ingest. I realize there is fluoride in water already, but you can’t compare the naturally-occurring variety to a by-product of the industrial industries. We buy reverse osmosis water from our health food store right now. We also have filters on our showers. When finances permit in the future, I want to buy a whole house water filter. We stopped using all toothpaste a few years ago. Just a scant tablespoon of Ipsadent Herbal Mouthwash in the DentalPik water each night and our teeth and gums look and feel better than ever. We also filter our own well water (ours is super high in iron) through a carbon block and UV light, so no added flouride, other chemicals or even pathogens are in our water! Coconut oil and sea salt? That sounds interesting… I use straight baking soda right now, but am open to branching out. 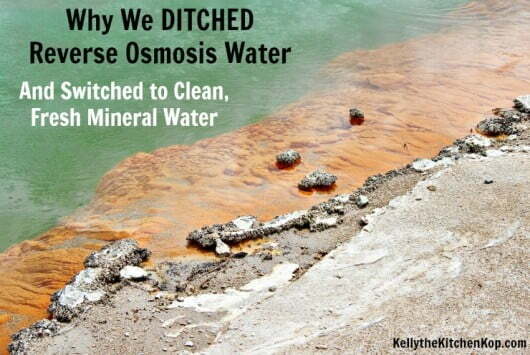 Kelly – I did the whole fluoride research too, as I have hypothyroidism. Still really researching the home filtration systems – haven’t been able to find a whole house one other than RO, and like you, I would prefer to keep the minerals if possible. I’m on a quest to remove all SLS, parabens, PEG-, triclosan, and fluoride out of my home. It has not been easy, nor will I be 100% effective because I found out last week my kitchen SILESTONE countertops have *Microban* built into them. Nice. Thanks for sharing this info… I at least got my hubby off Colgate Total when I told him about triclosan. What a messed up world when our gov’t allows pesticides in toothpaste, and industrial waste in drinking water. And outlaws raw milk. I get so frustrated by it all sometimes I just want to cry. To Wow – I won’t speak for Kelly, but I’ve found her to be quite open to a good discussion. To come on her blog and take such a tone is downright disrespectful, and won’t lead to anything productive. Love this Kelly! Thanks for breaking it down and including links. I’m looking more and more at nutrition as a basis for tooth health, since it’s pretty much the basis for all our health, and it doesn’t make sense to me that we’d be created to need fancy chemicals to keep ourselves clean and healthy. I’ve been brushing recently with baking soda and flossing, and that’s done great at keeping my mouth feeling clean and fresh. Since I’ve been paying more attention to my diet I’ve noticed the sensitivity I’ve suffered from my entire life is much better now as well. Great post! For someone who “can’t stand ignorance”, Wow you sure are spouting a lot of it. You even argue against your own argument. Fascinating. You might to actually read the CDC data yourself rather than someone’s biased interpretation. It’s amazing how the conclusions they publish have little basis in the raw data. Then again, if you don’t have the cajones to use a real name or e-mail address I wouldn’t expect you would have the courage to research and think for yourself. I learned a new word today. The word is “troll pressure”. Troll pressure happens when naysayers like this deliberately seek out blogs like ours to try to intimidate us with worn out, overly simplified, commercially driven arguments. When I say “commercially driven” I mean they are getting their information from well funded commercial interests disguised as research. Not surprised that this coward has a fake email address. Trolls are rarely brave and never have a shred of integrity. OK. Wow. You are nothing more than a common sheep. You don’t even have the guts to post a name. Look up who funded your research. Follow the money trail. Newburg, NY is the only place where flouride occurs natrally. No one has ever proven that flouride actually helps teeth. Alcoa Aluminum did a huge campaign to sell floride to the FDA as a supplement. Flouride is a byproduct of manufacturing aluminum. Sheer genius as now the government buys their waste product that causes your brittle bones, and pancreatic cancer. Woo hoo. We should all be so successful at marketing. One less …in the gene pool. Tooth soap…really. You are all falling for some good marketing techniques. There has been no research done on tooth soap. Just because some one says it is natural you guys will buy it. Precious. Fluoride does naturally occur in most water. The levels of fluoride in water can vary. Some communities actually naturally have extremely high levels of fluoride. It is a “natural” element that occurs in the soil and therefore it ends up in the water we drink. With more than 65 years of hard scientific research saying fluoride in water and toothpaste dramatically reduce cavity rates. You go and throw that away because some one puts a natural product in a bottle and calls it tooth soap? You all are just smart enough to be dangerous. And someone is making a lot of money off of you. I find it so funny that the author of this blog found the “truth” by talking to one orthodontist. And then drawing a conclusion. You really have to question someone that discounts the CDC and immunizations. Have you ever heard of Polio? Perhaps measles? Pertusis (Whooping Cough) is now making a come back and killing kids in the USA because of ignorant people not immunizing. You are darn right if you send your child to public school and have to get immunizations. I don’t want you putting my child at risk for disease because you don’t want to immunized. It is easy to say immunizations cause autism when no one really knows what causes it. It would be like me saying, “My kid drank water that was fluoridated and now they have autism.” So fluoride in water must cause autism. I Can’t stand the ignorance. How do you explain my 15 yr old son getting pertussis after being fully immunized AND having had the boosters? My grandfather used to work for the FDA and he says the argument originally used to add fluoride to water was that Native Americans who everyone knows had perfect teeth had fluoride in their diet and it was believed that it was the fluoride that had achieved this. Now, I have read personal accounts of people who knew the Native peoples here who blamed it on their lack of refined sugar in their diet and I took that to be most logical conclusion before I ever heard of Weston Price. Furthermore, fluoride is a waste product of the aluminum can industry. Is it just me or does this sound like a familiar pattern…we’ve got this poisonous waste product on our hands, what do you suppose we could do w/ that? Hmmm…let’s package it as a health ‘food’ and sell it! I really like my toothpaste: Aurevedic formula takes only a small amount. Brand: auromere herbal toothpast comes 4.16 oz tastes a bit like licorice. It contains fine chalk (a gentle cleaner), glycerine from vegetable oil, purified water, herbal extract blend: (Peelu (Salvadora persica) Neem (Azodirachta), Indian Licorice Root, Pomegranate rind, Common Jujube, Rose Apple, Clove, Persian Walnut, Barleria prinoitis bark (Vajradanti), Indian Almond, Bedda Nut, Asian Holly Oak, Prickly Ash, Zanthaxylum alatum (Tejibal), Sappan wood, Catechu, Bengal Madder, Acacaia arabica bark (Babil), Sasaparrilla, Cinnamon, Medlar bark, Mayweed, Bishop’s weed (flower extract), Silica, Sodium Lauryl Sulphate from INDIAN COCONUT OIL< Carageenan from seaweed, Cellulose gum from plants, Clove oil, Peppermint oil, Spearmint oil, Eucalyptus oil, Menthol, thymol, Aethhol, Geranium extract. If you are interested you can look at their website.. I get mine from a food coop a friend does, but I was really worried when for a while the coop discontinued the toothpaste. I had purchased a case, I alone use it, husband does not like licorice taste and won't try it, and thankfully it lasted for me the year or two when it was not available from the coop. One day I thought to yahoo it and found they had it online too. http://www.auromere.com Hope this helps you. I recently switched to an alternative, homemade toothpaste. I found a recipe online that I am sure you are familiar with, involving coconut oil, olive oil, Dr. Bronner’s and essential oils for flavoring (and Stevia). I tried it, but we live in a chilly land here. I had put it in dropper bottles and after it assumed room temperature, I couldn’t get it out. Plus, it didn’t suds, and was difficult to remove from the sink. Also, I just didn’t like it all that well. My mom uses some tooth soap that she buys online for $20 for a tiny dropper bottle. It lasts a while, but I am more frugal than that. So I adjusted the recipe I found online and came up with something wonderful. Unfortunately, I didn’t write it down. As I recall, the original recipe called for 5 T coconut oil, 1 T each olive oil & Dr. Bronners, and a few drops of essential oils for flavoring. Yay that I took chemistry in high school, and am an accomplished cook, for I know that it just needed more oil and soap. I *think* I used approximately 3 T coconut oil, 3 T olive oil and 2 T Dr. Bronners, plus mint flavoring until I could stand it. The other recipe calls for Stevia, but I just did without. It turned out beautifully. I melted the coconut oil and added the other ingredients, and stirred vigorously. It turned out white, and had a syrupy consistency. I put it in a container (a dropper would work, but of course, mine are clogged and unusable), and dip my toothbrush in it. It works great, it sudses, it clears easily from the sink, and tastes…okay. It tastes lightly soapy, but it’s not unbearable, unless you’re emotionally scarred from childhood. It takes some getting used to, and I am an adult, but perhaps if you allow your children to flavor their own, they might find something they can stand. I am very happy with the results and I have been using it for about two months. In addition, it was very cheap to make. Far cheaper than toothpaste, even with the price of coconut oil these days. Our dentist is always pushing fluoride treatments and telling us to drink tap water! I think she’s full of crap and she’s the only dentist who’s been so pushy about telling us to drink tap water. I have bought bottled water and filtered water for years. Probably the last 18 years. My kids grew up drinking that along with us and have wonderful strong teeth with no cavities. They are grown adults now with nice teeth and no mercury fillings. Even though the PROOF is right there under her nose she still feels the need to lecture us each time we go in. We haven’t been going to her very long and we won’t be going back there in the future. I think it’s disgusting to push fluoride on patients and make them feel that they are idiots for not going with the ignorant and dangerous flow! UGH We’re obviously doing something right is our kids grew up with healthy teeth! Hi Lora! Maybe we’ll run into each other someday at a Weston Price chapter meeting?! But if you come to the chapter meetings, that’s a good place to ask those questions! We have recently began digging into all the info out there on whole diets, and I have been absorbing all this info like a sponge! I love cheeseslave’s blog, and found yours through her…and was surprised and excited to find out that you live in Grand Rapids! We are on the Northwest side. We recently started buying our milk from Grassfield’s farm in Coopersville. That was the catalyst for our change in diet. Thank you so much for all your information! Is there anywhere local you can buy kefir grains or kombucha scobies? You can e-mail me directly also! Thanks again! Just to be accurate, fluoride CAN be naturally found in water, and some communities have to de-fluoridate their water to get it to safe levels. But that’s naturally found like you said, not a synthetic additive that is put into the water supply, you know? FYI: I just added some links to Jason brand toothpastes that have no Fluoride OR SLS. I have still been using their toothpaste from time to time… I haven’t noticed a huge change in my teeth whether I use that or Tooth Soap. So I’m not sure if the glycerin makes a difference or not. My teeth are healthy and strong — ever since I switched to a traditional foods diet, regardless of what kind of tooth paste I use. That said, it’s probably smart to avoid SLS and propylene glycol, and of course fluoride. I just can’t say that I’m always good about avoiding all of this junk. I do try! I just checked our Tom’s toothpastes and it said that the Sodium Lauryl Sulfate is derived from coconut oil, is that still bad? Sounds good to me, but I haven’t researched that specifically. First I want to say that I LOVE your site and really enjoy getting you blog updates in my email. It always gives me so much to think about! I would like to point out that the Tom’s brand of toothpaste always contains Sodium Lauryl Sulfate, which as far as I have researched is just a toxic sludge often added to shampoos and other products as a cheap sudsing agent. The best toothpaste I have found is Jason brand Healthy Mouth. Hope that helps! I just want to add the Tom’s of Maine Cinnamint is the BEST flavor and gets sudsier than the other natural toothpastes I have tried. I’ve tried a handful of other ones. It will be my only toothpaste from now on. Thanks Kelly! I tried searching for other information on the topic (that wasn’t from someone selling a product with it), but didn’t find much. After reading where Tom’s said their glycerin is derived from, I feel OK about it, so we’ll just stick with Tom’s. We got a Reverse Osmosis system, but if we had to do it over, I think I’d look into some other type of filter that takes out the bad, but leaves in the minerals. (RO water takes out EVERYTHING except H2O.) I would start by researching at http://www.urbanhomemaker.com and go from there. Which water filtration system did you get? I am researching this and trying to figure out which one to buy. Also, I have read that it is not good to use toothpaste containing added glycerin. I used to use Tom’s of Maine, too — until I found out about the glycerin issue. Apparently added glycerin creates a very glue-like sticky substance which is very hard to get off the teeth (notice how hard it is to get off of your sink!). I have read that toothpastes containing added glycerin do not allow the teeth to remineralize. It is also fluoride free. You can also brush with Dr. Bronner’s soap (although I don’t like the taste) or just water and sea salt. The sea salt is really good because of the minerals. 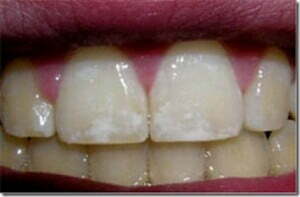 I use baking soda once a week or so to brighten my teeth.